There were more birthday goodies waiting for me at the knit shop Friday morning. Jessica and Mary surprised me with this wonderful array of exotic foods. 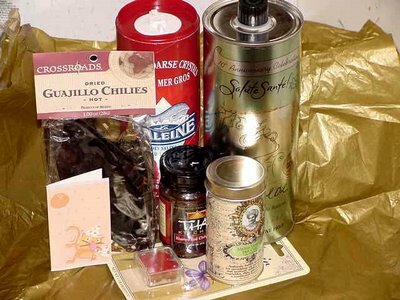 Clockwise from left: some dried guajillo chilies, sea salt, grapeseed oil, dried tamarind curry powder, a rich dark thai red curry paste, and a case of saffron powder. My first thought when I saw the guajillo chilies was that I could use them to make some more mole. I might still do that, but they are also the chilies used in harissa, which intrigues me. I'm very excited to have the grapeseed oil. I've been wanting to try it for a while. Everyone sould have some sea salt on hand. And I'll have to stop by Onu, the Asian market that recently opened down the street, for some noodles and vegetables to go with the Thai curry. I've been reading about tamarind curries recently and wanting to try some, so that's just the wonderful kind of serendipity that happens in life when you least expect it. And the saffron . . . I'm starting to get some ideas for Barbara's next Spice is Right challenge. What a tasty treasure trove. I'm one blessed foodie! One Good Thing about Summer . . .